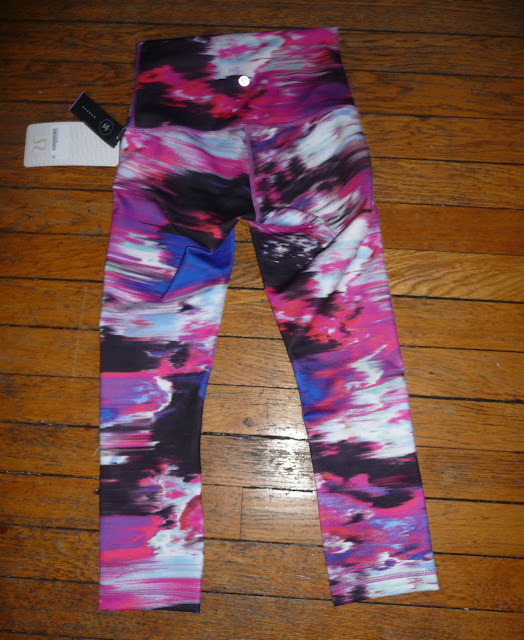 Spotted on eBay (thanks to Ms. A. for spotting this) - new Pigment Wind White Multi Hi Rise Wunder Under Crops. This is a US seller so these are either in stores now or will be very shortly. I really like this version of the pigment wind print. Based on the last photo I'd guess these are denim luon. Saw these today in the new flagship store in NYC at 5th Ave and 18th St. Very tempting but decided to pass on them. But anyone interested can call the store for them! Super pretty! I guess they are luon. Assume something will be made in luxtreme for running. What material are these? They don't look like luon to me. Wow, I like this print too! Can't wait to see these in person but worried about the print fade with the white backing. Just have to say, for anyone selling on eBay, I refuse to buy clothes someone's thrown on their dirty floor. What is wrong with people? Did you use them as a doormat, too, seller? @heather - based on the photo of the backside of the material I'd guess denim luon. i did see a large section of the &Go line, but I didn't look too closely. It was so crowded that I sped through there! I will look today for you. Heading up when they open to meet a friend. I'll check for you if you haven't called the store yet. First of all, thank you for all that you do. I love your blog, LLA. OT: You mentioned that you had bought the Kayak CRB. Like you, I have a large collection of CRBs, including a Spry one from a few summers ago. Do you find Kayak and Spry duplicative? TIA. Agree with @ 3:10 p.m. They look very similar to what Athleta might put out or TJ maxx's 90 degree brand. Perhaps its because of the luxtreme? Just ran through to check for you. It's full on luon. Nice and thick but when stretched, the white does show through. I did not try on. They had 3 size 4s out and all 3 had big areas of blue and black so I passed. The 2 size 6 that were on the models actually had a really good distribution of all the colors and the heathering of the colors. Just in case anyone was still thinking of calling! I forgot again to look at the hats though!! I do love the duck sauce in the hat, but wanted to hand pick it myself. But I ran through so fast. Hopefully they will still have a few good choices next weekend. Sorry no photos but I hope this helps a little. Just ran through quickly. No :(. But keep that store on your radar. They did have quite a few pieces that I have seen online and not in the other stores. They do have one girl walking around with the phone. I noticed this in the store on Prince St as well. They are good about phone orders. anon 8:51 what are you talking about? did you experience this???? I buy and sell on ebay and have stellar results, all the sellers i buy from the items are perfect. anyhow just curious. Full on luon according to the tag in that Ebay listing. Just FYI! Way too much pink, and the fabric looks cheap/like it would stretch to white. Easy pass. 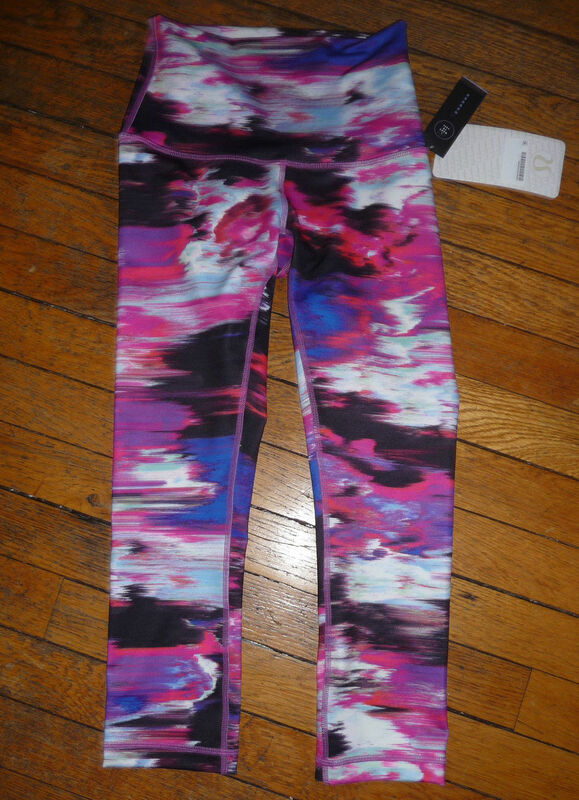 The print is OK but I don't go for this type of a pattern in a legging, I'm "boring" that way too haha. If it came in a CRB I'd consider it, but being white backed my experience with that type usually means it's a no go. I'm just an observer/reader and I shouldn't bother to comment, but: the hardwood floor is clearly old. It does not mean it is dirty. Consider/reconsider before you comment re: your judgement and assumptions. Rise and Shine but you will buy from a store that 20 other women have tried on and thrown on the floor? That's what a washing machine is for. You are buying on ebay this is not Nordstrom. "what is wrong with people"? I will consider photographing my things on my floor now, so that I can avoid the few buyers who would be like you. @ anon 12:23 pm - they have a habit of not identifying the denim luons as "denim" but will call them full on luon. There is a Forage Teal WUP out that if you look at the close up photo is denim but they call the fabric "luon". @ anon 9:16 am - I will put up some photos of the two colors tomorrow. I think they are close but different enough for bright blue fans. @Coach Emily - thanks! I figured it would fade when stretched since it has a white background. Stores usually will not do the picture thing for you. Especially during holiday. RISE AND SHINE- you are hilarious. I hope you buy clothes NEVER EVER TRIED ON BY ANYONE! What world do you live in? I've been buying on Ebay since 2005 and never have I bought a piece of item (that I plan on wearing) and wore them without washing them first. There are plenty of Ebay sellers who sell things photographed on wood floor, stone floor, marble floor, linoleum floor back drop. I have bought those items and never had an issue. I clean my floor twice a week with steam vac and it's probably cleaner than your home (i'm making an assumption just like you). What difference does it make since we buy stuff tried on by lots of people?? Think again before making judgment on others. Regarding that unnecessary nasty comment about the eBay seller posting items on the floor... well, I bought from this seller before, a HT (pigment wave multi) and she was super efficient, item came nicely packaged etc. How would you know the items you bought from the official LL website did not have the team at their 'warehouse' just 'place' items on the floor as they were packing etc. 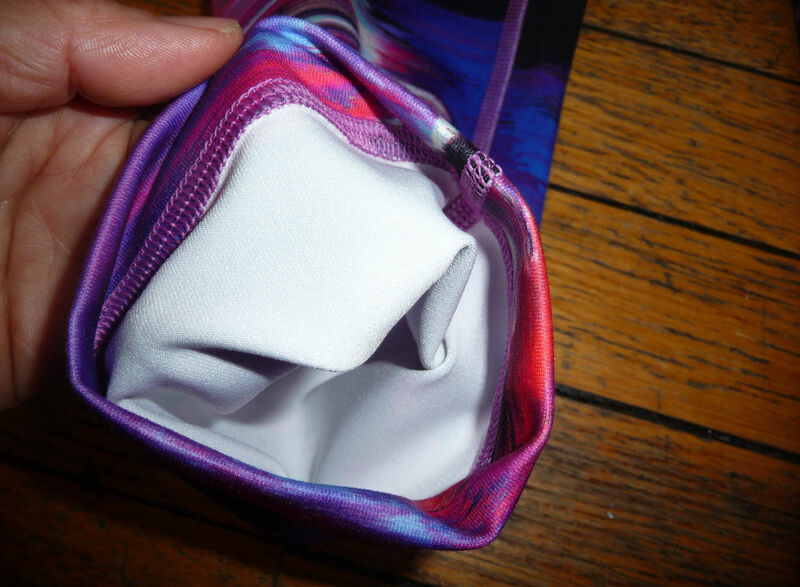 Thank you Ms. A, Coach Emily, and LuluAddict for keeping us up-to-date on the new Pigment Wind Multi Print Hi Rise. Listed on e-bay as Duck Sauce Pigment Wind. However, this pant print in this pic looks different than the Duck Sauce Pigment Wind items newly uploaded to the Australia site this morning (shorts; passion crop). To confuse things, there is also Pigment Wind Dragonfly & Berry Rumble only introduced in the Mind Body Kit thus far. I like these wild pants, but can't justify b/c 1) it's denim luon with a white backing 2) and it is too similar to the Pigment Wave Multi Hi-Times/Inspires from this Spring/Summer 3) & it's the only beginning of the Holiday Season product drops...too many things I want, but I have accumulated too much Lulu. ANON November 22, 2015 at 7:52 PM- Haha! What a great idea. I will do the same! This print is nice, but I'm not about to invest Lulu prices in a pair of pants that are very trendy and I won't end up wearing a lot. If I decide I need a super crazy pair of patterned pants I'll get them from TJ Maxx or Fabletics or something. What are the Runderful pants? I just got the brushed speed tights in the mail and am not crazy about them. I love the pockets! But the fabric feels a bit rough and does not seem like it will be warm. I'm thinking about returning them.. The fabric for the Lulu pant is sweatshirt material? I saw some passion crops in this pattern uploaded to Australia today. @ anon 11:52 am - Runderfuls are like Dog Runner pants - rulu tights with a swift fabric track-style pant on the outside. For warmer pants you should look at the Toast Tech Tights which are tech fleece. The warmest would be the soft shell front with tech fleece back Wind Runner pants, which are only in Canada right now. Anon November 23, 2015 at 7:01 AM- I bought things on Lulu website and more than several occasions, I received tank tops with white disgusting deodorant all over it. When I called GE, they have no idea how it got there. I would rather buy from an ebay seller who has clean Lululemon clothes laid out on wood floor than disgusting gross deodorant all over it! LLA : do you think there will be more down pieces ? I passed on DFTR jacket in hopes that there will be something more fun, like last years Fluff off stuff. Any intel? those pants look like they may have a high polyester content. 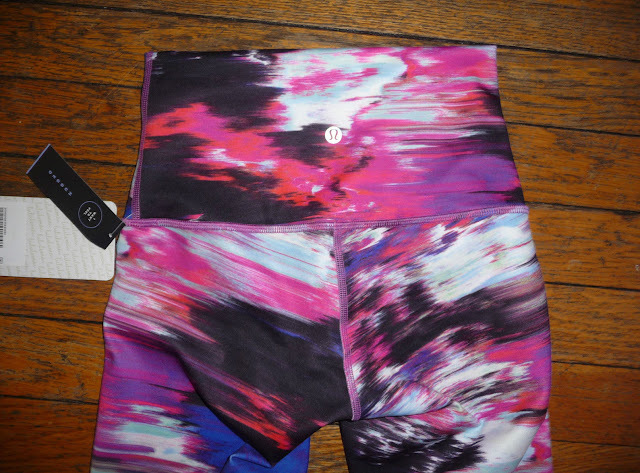 I bought a similar pair from Dharma Bums activewear for $60 and the color combo is a lot prettier, I have been doing yoga in them almost every day without issues or sheerness. I will stop at the flagship store to see how they feel and what the fabric content is on these puppies. Me too... I think thats DISGUSTING! I confirmed at the new lulu store on 17th and 5th avenue NYC. The content of those WUC is polyester (thick) and lycra. They have a shine to them. I swear you can get similar pants like that for less than $60.USD.